I LOVE hot and sour soup. If I'm eating at an American Chinese restaurant, I will choose hot and sour soup over the far inferior egg drop soup ten times out of ten. So, when I embarked on Soups Month here on Crisp, I know I wanted to try making my own hot and sour soup. A great hot and sour soup is always a delight. First, it hits you with an acidic kick that takes you by surprise. When done well, that kick is balanced with a combination of peppery heat, sharp tartness, and mellow earthiness. When it's not done well it's a gelatinous mess with pucker power. For my own hot and sour soup, I wanted to test the versatility of my homemade chicken stock by infusing it with asian flavors and thickening it with more egg than cornstarch. It worked pretty well and the end result is a delicious soup with depth and contrast. There are a lot of ingredients in this soup I had never used before (or heard of), but finding them wasn't too hard for the most part. Any asian (or Chinese-specific) grocery store should have everything you need. I say should because I went to three area asian groceries and couldn't find the Zhenjiang Vinegar I wanted. Apparently, the asian markets around Ann Arbor, Michigan are all Korean focused and Zhenjiang Vinegar is a traditionally Chinese ingredient (it's a rice-based black vinegar). Because I couldn't find it, I used a combination of regular rice vinegar and red wine vinegar - it worked out just fine, but I'd love to try this again with Zhenjiang to see how it changes. I looked at a lot of recipes for Hot and Sour soup in putting this together, and the way the heat is created varied greatly. Some used fresh chilis, others relied on chili paste-type ingredients, and there was one recipe ballsy enough to use sriracha (please don't do that). I don't like any of these options because the heat from chilis overpowers the other ingredients and makes the final soup too spicy. The spice ingredient that seems to be both the most traditional and the one that provides heat at the right level to help the other ingredients shine, is ground white pepper. This is what I used and it produced a soup with a pleasing heat, balanced well with the sourness of the vinegar. 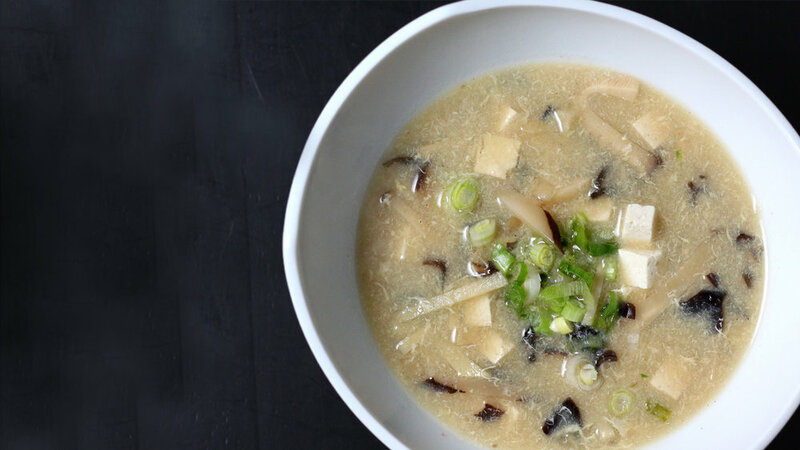 To round out the sharp and hot flavors, this soup is packed full of earthy ingredients like various types of mushrooms, bamboo shoots, and dried radishes. Most recipes also call for tiger lily stems, but I didn't use them here. The "Wood Ear" Mushrooms might also be called Tree Ear or Cloud Ear mushrooms or Chinese Black Fungus — I found this very confusing when I was researching and shopping for these ingredients, but this blog from Sybaritica breaks down the various names pretty well. In this version of hot and sour soup I use a combination of shiitake and wood ear mushrooms, along with dried diakon radishes, all of which need to be rehydrated using boiling water. Mixing the soaking liquid from the shiitake mushrooms into the soup helps infuse deep earthy flavor into the broth. This soup works well as a starter for a larger asian dinner, or serve a full bowl as a main course accompanied with dumplings or potstickers.